Welcome to the Darth Malak mods guide, the latest article in a series about Star Wars Galaxy of Heroes where we take a look at the best mods for individual characters. While I do not claim to have all of the answers in this game, I do my research and have used every toon I write about extensively, and Darth Revan is one character I have used a lot. These are mod recommendations based on the character’s kit and actual gameplay to help you in your quest to dominate the Galaxy of Heroes holotables. Today I’ll be looking at mods for Darth Malak. 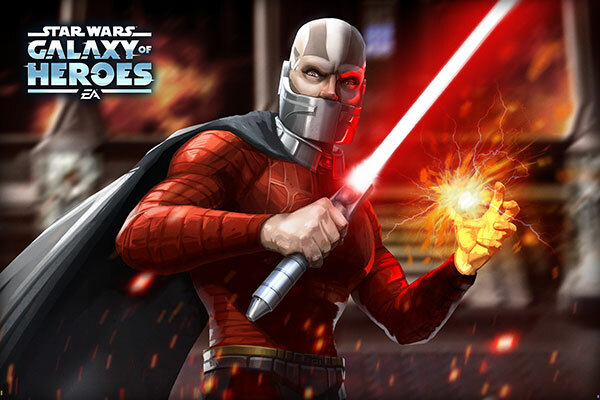 Added to the game a few weeks after Darth Revan first joined SWGoH, Capital Games announced the new (incredibly difficult) Star Forge Showdown on Wednesday, April 10th, a weekend event to unlock Darth Malak that ran April 12-14, 2019 for the first time. The addition of Darth Malak has certainly already made Darth Revan Sith Empire teams even stronger as it seems all who have geared up Sith Assassin are in for a letdown. Let’s take a look at the best mods to place on Darth Revan to make this exclusive character even stronger. Main Focus: Speed. Once again, despite the efforts of Mods 2.0 to deemphasize Speed in Galaxy of Heroes, the stat continues to be the biggest deciding factor for most META match-ups, whether the Squad Arena, Territory Wars or the Grand Arena. While you do not need Darth Malak to be as fast as his buddy Darth Revan, having him taking turns more often will only make your team harder to beat. In-game Mod Recommendations: Tenacity. My initial thought was “wow, what am I missing?” So as I re-read the kit again I focus in on the Jaws of Life unique ability. It reads that Darth Malak gains 35% Tenacity when less than 75% Health, doubled at less than 50% Health and tripled under 25%. So if Malak starts with 44% Tenacity (Gear 11 +3 pieces base Tenacity) and hits 75% Health, his Tenacity becomes 88%. At 50% Health he will then have 132% and at 25% Health that becomes 176% Tenacity – certainly enough to ward off more detrimental effects. But also factor in that Revan’s constant applications of Ferocity means -15% Tenacity per stack, so this is going to be a mathematical puzzle to say the least. My conclusion from this, and from my gameplay thus far is that Tenacity is certainly something to add as a secondary focus, but I would not focus on Tenacity and sacrifice any Speed or Protection as a result. Be the first to comment on "SWGoH: Best Mods for Darth Malak"